djkardkreations: It's the 25th ~ Time for PTI and Rudolph! It's the 25th ~ Time for PTI and Rudolph! Happy 25th Day of August 2015! I hope you're having a great day! 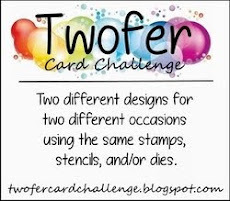 When I can, I like to play in two challenges that occur on the 25th of every month, so that makes it an automatic twofer day! After masking the top of the card base at an angle, I first heat-embossed the NBUS PTI outline "Vintage Linens" stamps in black. Then, using the PTI photo inspiration below as, well, inspiration, I stamped the solid stamps in PTI inks: orange zest, scarlet jewel, raspberry fizz, and spring moss. The sediment is SU. 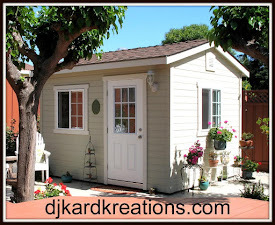 August 2015 Blog Hop Challenge for Papertrey Ink: Photo Inspiration. Less Is More: Sketch Inspiration. This OLC is adorned with NBUS Technique Tuesday "Chickadees" stamps which I purchased over a year ago. (Slap!) I'm not sure if I have used the "Jolly" die from Lil Inkers before, but I can tell you that the gold lamé paper from Tim Holtz is NBUS and I had a heck of a time cutting it. The red sparkly side embellies are Washi tape. The sweet little santa hats are from Memory Box. I drew a bit of ground for the Santabirds to stand on and then enhanced their beaks and feet with a gold At you Spica pen. After making this card, and enjoying a minute of Hammy doing a dozen summer salts to signify his pleasure, I took some photos. When the above photo appeared on the monitor, however, I sat with my head leaning over my left shoulder. To me, Mr. Santabird and Mrs. Santabird look adorable in their cute santa hats. Fine. But doesn't it seem like Mrs. Santabird is looking at something that isn't there? Well, I thought so, too, so I gave them some privacy for a brief 30-minute gestation period and now they are a family!! This time even I did a couple three summer salts! I know there is a baby bird in the Chickadee set, but I wanted a baby who was returning mama's gaze, so I used this cutie-patootie stamp from Paper Smooches "My Peeps" set. 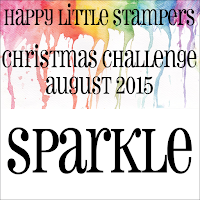 Happy Little Stampers August Christmas Challenge: Sparkle. 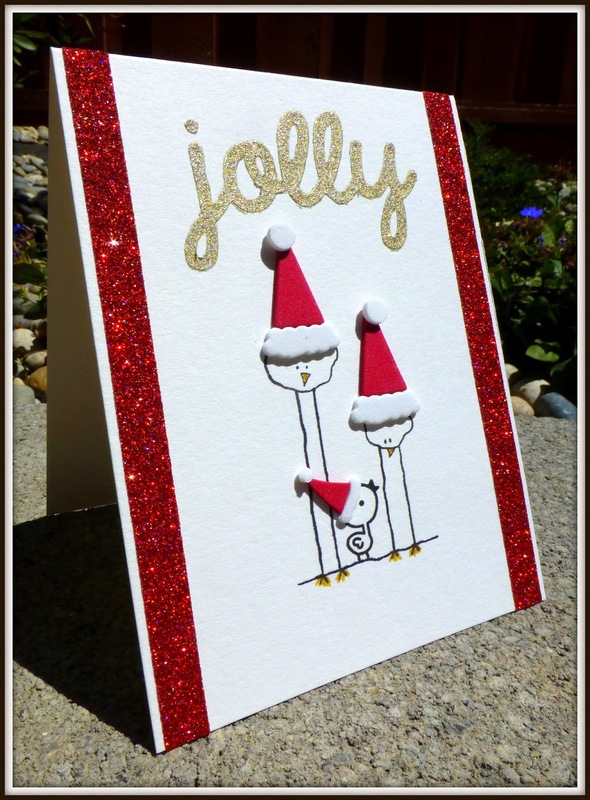 One-Layer Christmas Card Challenge: Christmas Card (w/o twist). Darnell there's so much to say about this fantastic post. It really did make me laugh and what a great surprise at the end to see that sweet little cutie looking up at his mummy. Your first card is lovely. The colours are striking and I'd never have known that the ribbon wasn't there at the start. It looks great with the swirly clip on. I have some which are NBUS. Your Christmas birds card is absolutely adorable, really so so cute. And yes, I for one do certainly look better dressed! OMG...two FAB-ulous cards Darnell and you really made me smile with your second card. Love the addition of baby bird.........way too cute. Clever cover up on the first card....no-one will ever know! Quickly posting a comment, can't believe I'm in the top 20! OK, PTI's blog hop card, gorgeous. Now why tell us there's a boo hiding under that rich ribbon! Love the little clip too! And the birdie card is a fav! Lovely to have added the glitter sides. Just darling! You are a hoot and the added chick is just perfect!! 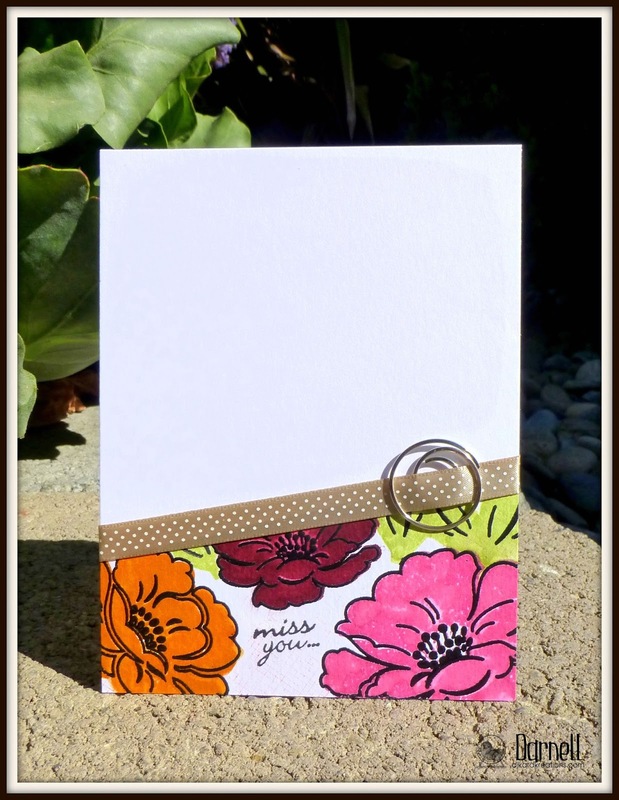 Love your Vintage Linen card for the blog Hop!! Don't you just LOVE that Vintage Linens set?!!! And what a happy accident with the smudge, as that ribbon and clip look just like they were meant to be there!! :0) And I love your Christmas chickadee card...they are just too cute! Great job on both cards Darnell, and have fun hopping! Another fun post, Darnell! That Hammy is certainly getting his exercise! Beautiful first card! I'm pretty sur that ribbon, sequins, flowers, etc., we're all made to hide our OOPS spots! You hid yours and dressed up your card...great job! I nearly spit my Gaorade on the screen when I read about a thirty minute gestation period! You always make me happy! The card looks so much more complete and balanced with that baby bird - great idea! Thanks for sharing! Two superb rescues there, especially on the second one, where the addition of the chick has transformed the card from very good to truly great! I love your take on the PTI inspiration. So smart to cover the Scarlet Jewel smudge with the ribbon - and bring in the brown from the photo. It looks fantastic! And your Christmas card is so much fun...as is your description of how you arrived at your final destination with it. I laughed so hard!!! Love it! 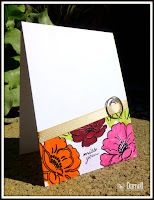 Your PTI blog hop card is beautiful - I love CAS style, and you've nailed it, then dressed it up a bit! The story of the second card is wonderful. I love the chick addition. And Papa does indeed look clueless. Tee-hee! Your PTI card is beautiful. I love the colors. If you hadn't confessed,we would not now about the accident. And the chicks in their Santa hats are absolutely adorable. But I must stop drinking coffee while reading your blog. Bursting out laughing and spitting coffee on the screen really is not good for it. Love your happy accident and fun way to use some of that ribbon we all have. The Christmas card is too darn cute! I'm still laughing my head off...and admiring your ingenuity. Mr. Clueless Chickadee just struck me funny...and the who are you Mrs...well, that's how I felt about my kids when they reached puberty. Seriously though, your happy accidents always turn out well. Your PTI card proves it. The bird card, well those creatures have been calling my name for a year now. Don't know why I never purchased them. Fun cards...see a winner in your future. And thank you so much for continually being supportive of my feeble efforts. It means a lot. Red is a little naughty in the bleeding area, but you are right about the ribbon and the same goes for my little bleed through on my berry card. HAHAHAHA! Your posts always brighten my day. Fab cards. I love it when we have to cover up a problem and think the card looks better for it. Beautiful card for the Blog Hop. I must admit, I wasn't inspired too much by this picture. I know I should have gone with the colors but just didn't get one done. And those Santa chicks are so adorable. Ha ha ha!! You made me laught with the story of the mom's bird gestation in 30 minuts... :D How sweet and fun is your card! These birdies are supercute! And on the first card I say that your happy accident is as that mine with the embossing/debossing :D Your lace with the clip looks great! Two awesome cards, Dolly!! Love your beautiful blooms, and the ribbon and clip really add a bit of glam ... it's just a bonus that it covers up a little bleed! Great job with that! Two fabulous cards. Your first card is stunning and as others have said the ribbon looks as if it should always have been there! And as for baby Santa - so cute! I've looked at my children many a time thinking - who are you!!! Still do in fact! Love both of these! The first is so pretty and what a great idea to cover the boo-boo with the ribbon. Looks like it belongs there! Love the addition of the clip too. The Santa family is outstanding! Love those long legs - and wish I had them! Don't you just love when the mistake makes the end result better....love the touch of ribbon and those deep rich colors. And the family...swoon...perfection Darnell! This has got to be one of the funniest posts I've ever read! Baby bird is the milkman's? So funny. Thanks for the chuckle! Two perfectly diddlyscrumptious makes today Darnell, a lovely twofer! Your Blog Hop card is so pretty. I still have Vintage Linens on my long wish list. Love seeing everyone's designs using it!! 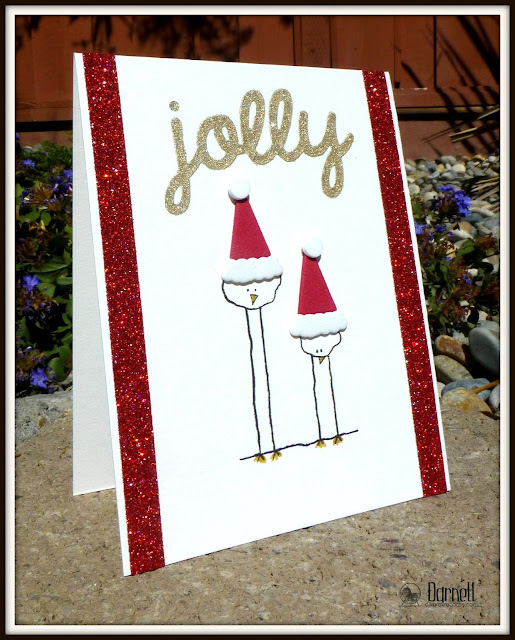 I haven't started Christmas cards yet, but your Santa Birds have me thinking I should!! The wee bird was a perfect addition to the family!! Fantastic cards! 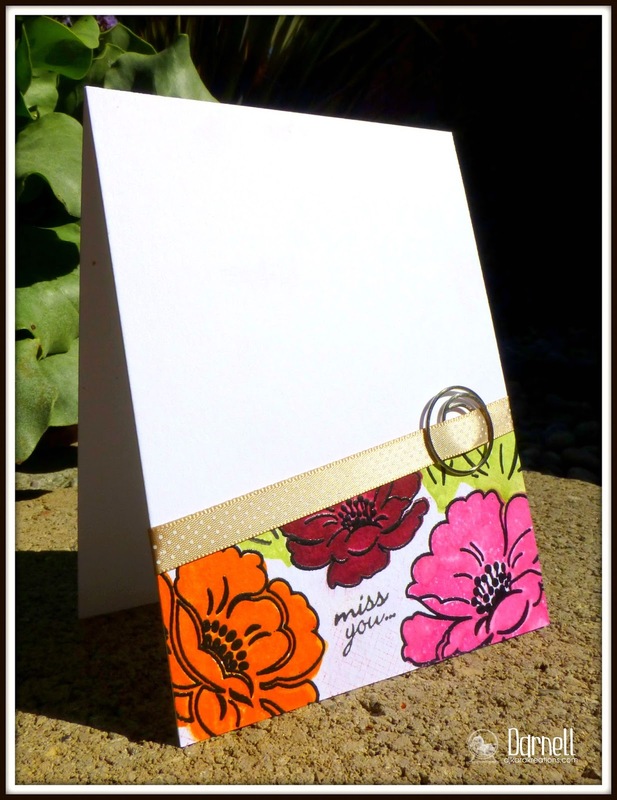 Love your bold floral card, great design and your Christmas card is too cute. What lovely cards you created Darnell. I love the "happy accident" that you made on the first card. The ribbon looks perfect!! The second card is just to cute. Great design! Two fabulous cards Darnell and especially love the bird one, even mores with the addition to the Family. Both fantastic cards, love the striking colours of the first and fabulous use of the LIM sketch but those chickadees steal the show! Such adorable and fun little stamps and accessorised brilliantly. Two wonderful cards and your little commentary had me laughing out loud here! Happy mistakes always make my heart sing. You covered the oops very well! The chickadees are so cute. Good call on adding the baby chick, too! Too cute. Nice save on the first card. And the Santa chicks are adorable! Ha, ha, Darnell, this is one hilarious post. Love the chickie card, so sweet and fun, I love "happy accidents",LOL!! Thank you for the laugh and for sharing this two beautiful cards. Do you think it was the coalman's then? Pfffwrt!! You are so funny Darnell. Liking the lopsided first card too. Like a bit of lopsyness!! Two wonderful cards! The ribbon and clip are a nice touch - love it when I am able to fix boo boos! Love your birdie card - the baby bird is the perfect addition! Two great cards Darnell, I love those chickadees ( I have them too) and they look great in Santa hats! The bold flowers in the other card look so vibrant too! I love the Santa Birds and love that stamp set. Did not realize the bird was adopted. You fooled me. Your interpretation of the Christmas Story had me snorting in my early cuppa tea. Pretty much what Mary and Joseph woulda been thinking, I'd reckon!!! ANyways....LOVE it. Loved it at first for the red glittery tape. then the birds, then the 3some. SO poor first card gets completely overlooked.....!! GREAT save on it,I must say.....love that you got to use...that stuff that breeds here and ne'r sees the light of day....OH! That's its name...RIBBON!!!!!!!! Oh dear! I hope I didn't stand on any toes with my comment. I AM a Christian....I just like to have fun with the Big Dude and His family at times. Anyways, Jesus had a great sense of humour, so I'm sure He'd be chuckling alongside me.....hoping;)!!! Your first card is so pretty, Darnell! And your second one is super sweet! Had to laugh reading your post. If you hadn't told us about your happy accident, we never would have known. You disguised it beautifully. And in your second card, Mr. and Mrs. Santabirds are just precious looking down at little Santa birdie. So sweet, Darnell! OMGosh. adorable how you "fixed" these. indeed both fixes look better. happy medicine for sure. I am so going to make a card with that simple sketch. the first card is gorgeous, but EEK!!! how I love the second one!!! Love them both! I think your happy accident really finished off that top card! Love love love these!! Those birdies are ADORABLE!!!!!!!!!!! Two lovely cards from you. I especially like your Christmas birdies, and the cute story to go along with the card! I LOVE the ribbon & and the sproinky! I noticed the wee pop of "glam" before I even read your post...and loved the result! Nice fit with the gorgeous colors you used for the flowers! The chickadees and the santa hats....soooo cute! 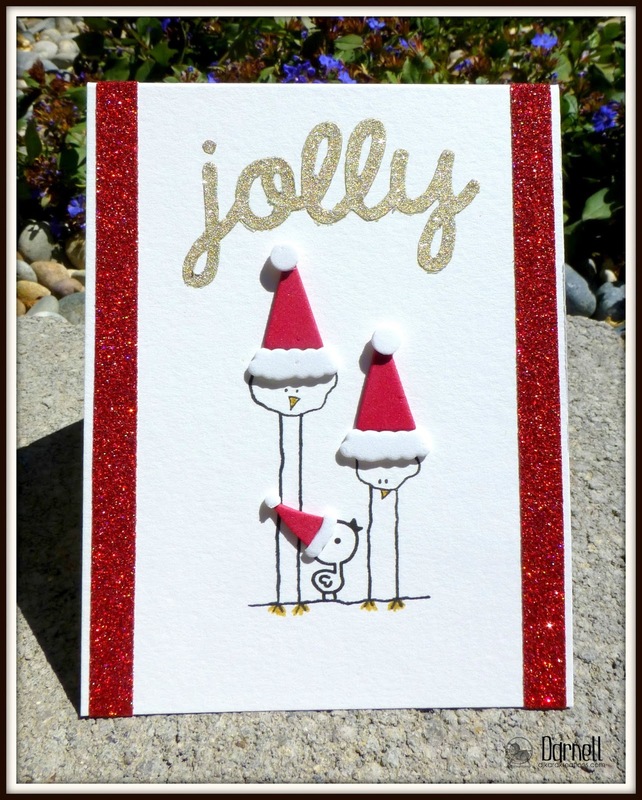 The red & gold glam adds a nice bit of holiday sparkle to the card! Another brilliant save by Darnell. Though I have to say that little chickie looks like it might be a ring in. I ould be asking for a DNA test if I was the mister. Love both your cards. Still smiling while typing this; you really know how to write a post! Love the story about the X-mascard! And it is a funnyone! Love the flowercard and glad the bleeding did make a better card :) Have a fun day! Super cards Darnell. . . watch out for those Hammy somersaults!!! great designing of them both. I love a bit of glitter on Christmas cards too. Wonderful stamped images on them both too. Absolutely beautiful card love the bright rich colors! Wonderful! I love that you used a swirl paper clip! It's so fun to pull out an older embellishment and see it in a new fresh way. Love your inspiring card Darnell! I LOve it when you give me my favorite birds!!! Love the second one !!!!! And I love the sun !!!!!!! No much of sun here !!!!! Oh...how cute is your little doodled chick!? Love all the sparkle too! Wonderful cards - the first is so lovely and fresh and full of pretty blooms!! The second - delightful and fun and what a cute Christmas card!! So sweet and I love the little festive family!! Hope you are doing well and feeling happy!! Oh, Darnell, you do make me chuckle. Fabulous addition to your little bird family, such a cute card. And great save on your first one with the ribbon and embellie. They say everything happens for a reason so the pretty ribbon was just meant to be there all along! LOVE, LOVE, LOVE your sweet chickadee family! And thanks for the smiles you caused with your little story. Visiting here is always like a ray of sunshine in my day! I'm wearing my HLS Christmas Hat, but I saw this one, and just had to scamper over for a closer look. You are way too funny with Mrs. S, but yeah, she did look puzzled. Now I know why. This has got to be the cutest thing. And love the side bar sparkling paper too! So glad you joined in with the HLS Christmas Sparkle Challenge. TFS & Big hugs. I know I do. Look better clothed, that is. Love both your cards, and I really appreciate how you didn't notice the look on mama bird's face until you looked at the photo. That happens to me All. The. Time. Problem is, I've usually mailed off the card by then, so there's no chance to fix it. You found the perfect way to give mama bird something to look at and make the card even merrier. Oh my goodness--LOVE your adorable Christmas card, Darnell! The little guy is so perfect! Your first card is beautiful & I do love the ribbon & clip! Fabulous cards!! I think the addition of baby bird is a genius move ... Completely transforms that card ... It's spectacular! I love how you "fixed" the first card with ribbon and a clip. It just added to the pretty card. The bird card is adorable. I love the addition of a baby to the family even tho mama is somewhat stunned at the results. Not all babies look like their parents at first, so I think she'll come around. Gorgeous cards, Darnell! LOVE the bird family and the flowers are so elegant! A perfect amount of sparkle! 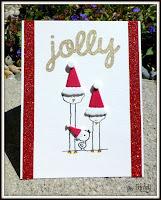 First I swooned over the beautiful flower card (love the ribbon and paper clip), then I awwwwed over how cute those birds look with their Santa hats, but when you added the little baby bird I melted into a puddle! How adorable, oh my! Beautifully coloured flowers and alove the spiral clip. ADORE the Christmas birds!!! Hehe. love your chickadee family! So lovin those cute birdies. Love the story behind the evolution of the card. Have a wonderful weekend Darnell. You sure know how to tell a good story - still think you'd make a great stand-up comedienne, but so glad you enjoy stamping and blogging and spreading your cheer throughout stampland. I'm amazed at how much that baby bird added to the card, not just the story, but the card itself. This post is a wonderful lesson on how to improve things when something doesn't look just right. I just ordered that Vintage Flowers set and I love what you've done with it, Darnell. Who would have ever thought to put Santa hats on the chickadees? You and Hammy, of course. So cute. Very elegant Christmas birds :-) great used sweet stamps, great composition and color of the card. 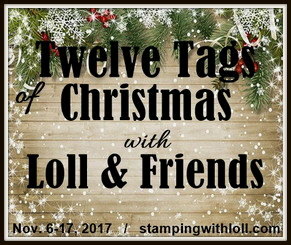 Thank you for sharing with Happy Little Stampers. Your dressed up card looks wonderful, Darnell!!! 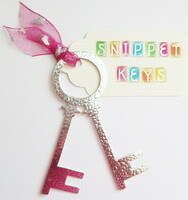 Love the pretty polka dot ribbon and the swirly clip!!! The flowers are beautiful!!! And the bird card and your story is just so cute and had me haha, as always when I visit here!! !